« Photos of the day: ANOTHER walkoff win in Omaha! 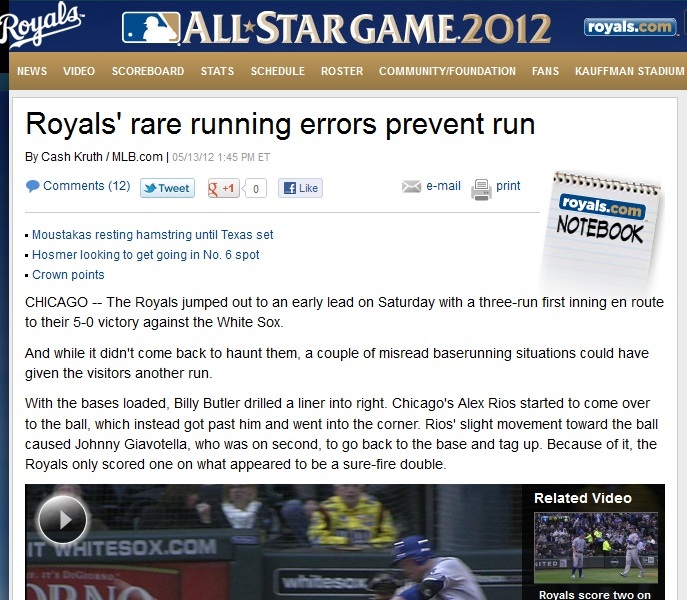 Below is a screengrab from a Royals.com story. I can’t even wrap my head around this editorial decision. I'm sorry, what did you say? Am I misreading that headline? Let's take a closer look. Yeah, that says what I thought it did. But let's look a tiny bit closer. Yep. It's official. They think we are that stupid. Five Foto Friday: Storm Chasers! Just kidding, it’s not actually Opening Day! It does seem like there have been an inordinate (tongue-in-cheek) amount of caught stealing at third. Or pop-gun arms throwing our guys out at second… Maddening! And certainly contrary to this headline.